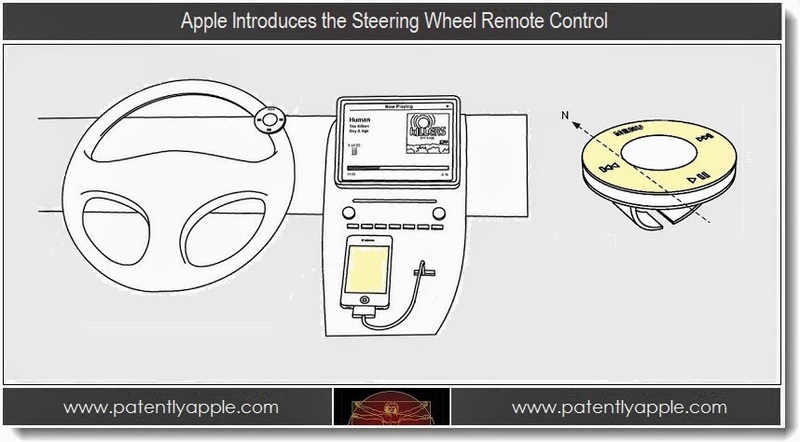 Remember This Apple Steering Wheel Remote Patent? CarPlay Remote Coming? Almost exactly two years ago, we reported on a patent granted to Apple by the US Patent and Trademark Office for a steering wheel remote control. From the patent document illustrations, the remote looked like the dial of an iPod Classic. At the time, it was the first piece of hardware for your car that Apple had anything to do with. Two years later Apple is all set to make its CarPlay technology a major player in today's vehicles. So will we see a steering wheel remote dedicated to control CarPlay anytime soon? We've already seen a video showing CarPlay being controlled without having to use touch controls. Mercedes-Benz vehicles will feature CarPlay control using its wheel and jog in the center console. Apparently, the German automaker doesn't have touch screens in their cars due to safety concerns. So, it would only make sense if Apple chooses to bring a steering wheel remote to the market. The remote could connect to the car's infotainment system via Bluetooth and could have a Siri button. If such a device is ever made, it would possible be the last steering wheel interface you'd need.